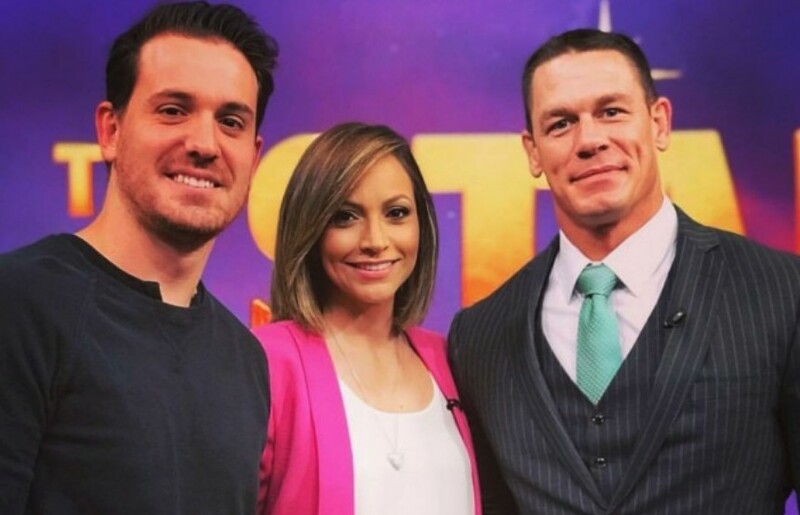 Luis Rodriguez (left) with Emmy Award-winning journalist Satcha Pretto (center) and John Cena on the set of Univision’s popular morning show Despierta America. What is your job title, and where are you working? I’m a network producer at Univision. How did you get your job? I was picked as part of a group of eight during Professor Alejandro Alvarado’s Telemundo/SJMC Hispanic Media Futures, which had me seeing executives from every branch of the business on a weekly basis. We met with everyone from the vice president of news to the senior vice presidents of sports, employment and training services and branding. Eventually, I decided that I wanted to intern with the branding department, but fate had other plans for me. I joined the Telemundo Network Newsroom in the summer, and then left for Univision four years ago to join as a full-time producer. I haven’t looked back. What was your greatest fear going into your first job and how did you face it or overcome it? The branding department was where I wanted to be: I felt like the things they needed from their interns were my strengths and that I’d be happy selling. On my first day of internship, I was informed that the branding department did not have a second spot for interns. I was told that I had to choose a “second best option.” A second option? Of what, a career? I had no idea how to even reply to that question and felt incensed that I was going to be doing something I didn’t want to do. It took me two weeks to get the news bug — that’s when I broke a story to the newsroom about a stabbing outside of the Empire State Building in New York. Now my life revolves around wires, rundowns, coding and editorial decisions and I could not be happier. What surprised you the most about your first job? That I would like it! I sincerely felt that I was going to be throwing away my time, and it felt like that for the first two weeks. What advice do you have for those beginning the job search process? Be flexible, and get ready for speed bumps. Your plans may not always go exactly how you want them to, but you must use these obstacles as learning moments and not let them bring you down. There’s a reason why it’s happening! What does a day on the job look like? Early morning coffee while I read the front pages of newspapers. After a while, the morning editorial call takes place and everyone links up in deciding what stories to assign reporters. Once I’m at the office, I begin preparing the show. That includes everything from graphics to rundown timing to lower thirds and everything in between. There are days that are very slow and there are days when six hours feel like 20 minutes because of constant breaking news. How does your job connect back to your coursework? Many of the editing courses and journalistic integrity/ethics courses included basic skills that I use every day. Having a good aesthetic eye, as a result of my concentration in visual information and how to display it, also helps me create graphics and animations that add to the story and help viewers understand what we’re trying to convey. How has your transition from school to work? How do you balance your time? I let go of the fantasy that is being able to have a steady schedule! I sometimes work 4 a.m to 1 p.m. as a producer for Despierta America, but sometimes I will be at Newsport from 3 p.m. to midnight on a Saturday updating the show for the west coast. My transition was day and night. I knew when I had to be in classes. Today, I don’t know if in the moment I’m writing this I will be called into work because of a breaking news. What’s been the coolest thing about your job so far? The traveling. I flew to Cuba when Fidel Castro died as the field producer for the coverage. I stood in 155 mph winds in Puerto Rico. I produced the opening of the Copa America in California and the 2016 GOP convention in Cleveland. I’ve no idea where I’m going next, but I’m ready.